The epic seasonal voyages of migratory birds have long confounded scientists – now satellite tracking technology is revealing precisely how they do it. The Arctic tern, a black-crowned seabird weighing no more than a bar of soap, flies from the top of the world to the bottom and back again every year. That’s 40,000 kilometres as the crow flies. But when researchers equipped terns with satellite tracking devices, they discovered that these birds don’t take the shortest path. One individual, tracked in 2015, ended up covering close to 100,000 kilometres – equivalent to more than twice around the planet. Thanks to lightweight trackers, we can now follow even the smallest birds on their spectacular journeys. What we’re finding along the way is amazing, says Hedenström. “In just a few years, we’ve learned more about migration strategies than from a century of ringing.” Meanwhile, mathematical modelling and molecular biology are also bringing fresh insight into why and how they do it. There is still a lot to learn, but from where these birds really go and how they navigate to the tricks they use to prepare for such epic journeys, the story of avian migration is not standing still. It’s not hard to see why migratory birds leave places such as northern Europe for warmer climes like central Africa as winter draws in: why struggle through colder temperatures, shorter days and scarcer food supplies when you can be somewhere with pleasant temperatures and plentiful food. But that raises another question: why do these birds risk their lives by flying thousands of kilometres back each spring? Why not stay where it’s warm? That might explain why many migratory birds are in such a hurry during their spring migration. Last year, when Hedenström and his colleagues tracked common swifts flying across the Mediterranean and the Sahara desert, they found that some birds took more than two months to complete the southern journey in autumn, while all the birds they tracked heading north in spring crossed in under two weeks. Then again, in terms of the evolution of intercontinental migration, it’s far from clear that all birds making these journeys today started out travelling north from the tropics during the summer. In 2014, Ben Winger, now at the University of Michigan in Ann Arbor, and his colleagues built a mathematical model to reconstruct the geographical ranges of the ancestors of hundreds of living species of American songbird. They found that most long-distance migrants began in the north and started flying south for winter, as opposed to being tropical birds flying north for summer. All of which still leaves open the question of why some species fly tens of thousands of kilometres every year. Why not find somewhere closer for a winter escape? We’re still a world away from a conclusive answer. One idea is that favourable winter-summer habitats slowly drifted further apart as a result of plate tectonics, forcing birds to cover just a few extra millimetres each year – but vast distances millions of years later. Even that can’t explain the curious long-haul journey of the ancient murrelet, a member of the auk family that includes puffins and guillemots. Tracking studies from 2014 showed that these birds fly almost 8000 kilometres across the north Pacific, from Canada to Japan and China, even though there is little difference in the conditions at the two destinations. How do birds get in shape? Migratory birds are extraordinary endurance athletes – and their feats require some serious preparation. In the weeks before take-off, many undergo extreme physiological changes. Most obviously, they load up on fats. In many cases, that means temporarily supersizing their digestive organs to ingest as much food as possible. Then, immediately before departure, they shrink their digestive organs to reduce their flying weight. But that’s not all. At least one species indulges in what Jean-Michel Weber at the University of Ottawa, Canada, describes as “natural doping”. Weber noticed that the semipalmated sandpiper, which flies non-stop from the Bay of Fundy on the east coast of Canada to South America at the end of every summer, mainlines on mud shrimp before departing. Mud shrimp are loaded with omega-3 fatty acids, and Weber suspected that these compounds boosted the efficiency of the sandpipers’ muscles. To isolate their effects from other factors, he turned to a more sedentary bird. Sure enough, when he fed bobwhite quails a cocktail of fatty acids equivalent to the diet of the sandpipers, the amount of oxygen that their muscles could use shot up by 58 per cent. Migrants’ preparations don’t stop there. Several species, including the red knot, are known to bulk up their heart muscles so they can pump more oxygen-rich blood around the body. The bar-tailed godwit, however, might have the most effective way to supercharge aerobic capacity. Its levels of haemoglobin, the molecule that carries oxygen around the blood, increase considerably in the weeks before migration. That helps explain how the godwit can fly for more than 11,000 kilometres without a rest. 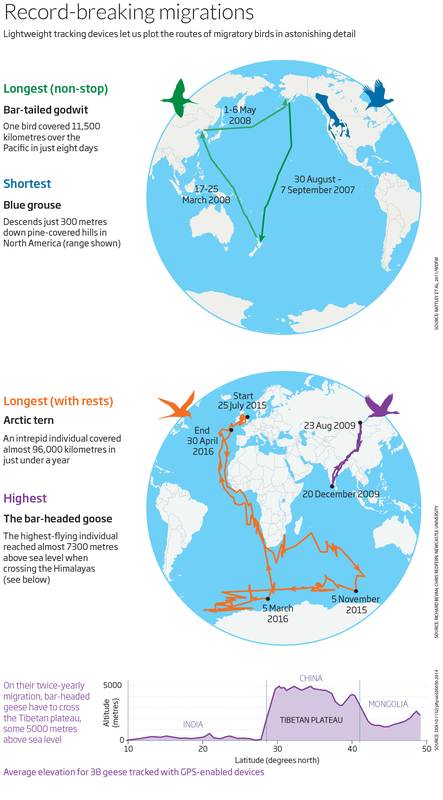 This epic journey, revealed back in 2007 by one of the first big satellite-tracking studies, makes it the longest known non-stop journey by any bird (see diagram). Migratory birds are punctual when it comes to departure times: all individuals in a species tend to leave at roughly the same time. But they do appear to be able to respond to shifts in conditions from year to year, so they arrive at their destination when the going is good. This suggests they respond to an external stimulus, something triggering that irresistible migratory urge known as zugunruhe – from the German zug, meaning movement, and unruhe, or restlessness. But what tells them to depart? The most important indicator that the seasons are changing is probably sunlight. It’s clear that shifts in the length of days are a major factor in triggering zugunruhe. It is far from the only thing they pay attention to, however: in studies where day length was artificially kept constant, several species of migratory birds still knew when to leave. What’s more, for birds leaving from the tropics, where day length barely changes all year round, there has to be something else. Changes in air pressure, predictive of incoming weather, seem to have an influence, as does food availability. In 2011, Peter Marra at the Smithsonian Migratory Bird Center in Washington DC demonstrated that American redstarts delay their spring departures if dry conditions in their overwintering areas mean they struggle to find enough food to prepare for the journey. How do birds pick their route? “Tracking is teaching us that different birds may follow very different routes, and they are often far from straight,” says Hedenström. Take the Arctic tern, whose monster detour means it may travel 60,000 kilometres a year farther than the most direct trip. Such diversions are typically down to finding suitable rest stops, but wind has a big say too. Because birds fly at speeds comparable to typical wind speeds, head and side winds can pose a considerable challenge. Several tracking studies have revealed that birds take hefty diversions to find favourable winds, allowing themselves to drift when it is more energy efficient than keeping to a straight line, says Hedenström. Last year, for instance, a team led by Kyle Horton at the University of Oklahoma used weather radar to track flocks of songbirds that migrated by night across North America. They found that the birds drifted sideways on crosswinds but then adjusted their course near the Atlantic coast to get back on track. Another recent tracking study, this time following frigate birds migrating across the Indian Ocean, revealed not only that they seek out cumulus clouds so they can ride on the strong updraughts beneath them, but also that they appear to sleep as they ascend. Bar-headed geese, which migrate over the Himalayas, have a similar appreciation for the optimal elevation. They constantly change height, descending into valleys where the air is denser and more oxygen-rich whenever they can, then climbing when necessary, using updraughts where possible. This significantly reduces the energetic cost and physiological strains of the trip. In any case, the choice of route is critical: a 2016 study tracking cuckoos, for example, found that at least two-thirds of the birds following an eastern route through Italy or the Balkans were likely to survive, whereas animals choosing a shorter route across Spain or Portugal faced a much higher risk of dying on the trip. The researchers suspect that drought conditions in Spain, increasingly common over the years they studied, are to blame. The senses that birds rely on to find their way largely remain mysterious. This is especially true for species that travel individually, which means young birds have to figure out where to go without a flock to follow. It is safe to say that birds probably use all their senses: visual landmarks as well as the sun and the stars provide them with information on their position, as do smells for some species, especially seabirds. But there must be something else, because birds still show a clear tendency to take off in the right direction even in total darkness. That something is an ability to detect and navigate by Earth’s magnetic field lines that has confounded scientists for decades. At this point, there are two main contenders for the molecular mechanism underlying “magnetoreception” in birds. The first relies on crystals of magnetite, a form of iron oxide, found in the upper beaks of several species, including European robins and garden warblers. But it has proven maddeningly difficult to demonstrate that magnetite plays a part in magnetoreception. Perhaps the most promising work comes from fish. In 2012, Michael Winklhofer at the Ludwig Maximilian University of Munich, Germany, took cells containing magnetite clusters from the snouts of rainbow trout and placed them under a microscope around which an artificial magnetic field was rotated. Sure enough, the cells also rotated – and their sensitivity was much greater than expected. However, it’s not yet clear how those cells might send signals to the brain. The alternative explanation involves light-sensitive proteins called cryptochromes, found in the eyes of all kinds of migratory animals. The idea is that magnetic fields alter a quantum property called spin in the electrons within these molecules, flipping them back and forth between two different states. That in turn changes the chemical behaviour of those molecules, which results in Earth’s magnetic fields being superimposed on the birds’ vision. Studies have shown that these proteins are sensitive to magnetic fields. Again, though, the task is to see the process in action in a living being and show it is connected to its brain. One recent study suggested the two mechanisms could be part of the same system. Even if they are, that still wouldn’t give you the whole story, says Hedenström. Although statistics on causes of death for migratory birds are hard to come by, there are plenty of ways to die. Storms, for starters. And yet one recent tracking study dramatically reveals how resilient some birds can be: a whimbrel caught in tropical storm Gert, off the coast of eastern Canada, was found to have endured extreme head winds for 27 hours. By far the greatest threat comes from humans. Some of the countries in and around the Mediterranean are notorious for the annual slaughter of migratory birds. Researchers estimate that 25 million birds are illegally killed or captured in the region every year (see “The beautiful bird corpses left by illegal Maltese sharpshooters“). Some Caribbean islands have a similar reputation. Indeed, two whimbrels carrying trackers safely negotiated hurricane Irene in 2011, only to be shot in Guadeloupe a few days later. Then there is the new threat posed by climate change. Rising temperatures are likely to cause more extreme weather events and may make the weather more unpredictable, meaning the primary cues birds use to decide when to leave may become less reliable. Higher temperatures may also shift the peak in the availability of seasonal foods in stop-over or breeding areas away from the birds’ moment of arrival – a problem already documented in European pied flycatchers. The biggest human-made problem facing migratory birds is still habitat destruction. Favourite stop-over sites may disappear from one year to the next, compelling migrants to continue without food, water or rest. You might think the ability to travel large distances would make it easier for these birds to find better places to feed and breed, but migration appears to make them vulnerable: around the world, their populations are declining faster than those of birds that don’t migrate. Kategoria(t): Riistanhoito Avainsana(t): Massamuutto, Muuttolinnut, Muuttoreitti. Lisää kestolinkki kirjanmerkkeihisi.